Sueoka K, Satoh H, Onuki M, Mino T. (2009) Microorganisms involved in anaerobic phenol degradation in the treatment of synthetic coke-oven wastewater detected by RNA stable-isotope probing. FEMS Microbiol. Letters. 291(2): 169-174. 押木守, 小貫元治, 佐藤弘泰, 味埜俊 (2009) 活性汚泥プロセスにおける有機性一時貯蔵物質の蓄積, 下水道協会誌. 46(566). 126-137. Oshiki M, Onuki M, Satoh H, Mino T. (2008) PHA-accumulating microorganisms in full-scale wastewater treatment plants. Water Sci Technol. 58(1):13-20. Otawa K, Satoh H, Kanai Y, Onuki M, Mino T. (2008) Rapid quantification of total viral DNA in the supernatants of activated sludge samples with the fluorescent dye PicoGreen. Lett Appl Microbiol. 46(4):434-438. Kitsuka K, Onuki M, Katayama H (2007) Survey on development and management system of public toilets in Beijing - Case studies in Dongsi and Xianyukou areas JOURNAL OF ASIAN ARCHITECTURE AND BUILDING ENGINEERING 6(2): 315-322. Lee SH, Otawa K, Onuki M, Satoh H, Mino T. (2007) Population dynamics of phage-host system of Microlunatus phosphovorus indigenous in activated sludge. J Microbiol Biotechnol. 17(10):1704-1707. Michinaka A, Arou J, Onuki M, Satoh H, Mino T. (2007) Analysis of polyhydroxyalkanoate (PHA) synthase gene in activated sludge that produces PHA containing 3-hydroxy-2-methylvalerate. Biotechnol Bioeng..96(5):871-80. Otawa K, Lee SH, Yamazoe A, Onuki M, Satoh H, Mino T. (2007) Abundance, diversity, and dynamics of viruses on microorganisms in activated sludge processes. Microb Ecol. 53(1):143-52. Lee SH, Onuki M, Satoh H, Mino T. (2006) Isolation, characterization of bacteriophages specific to Microlunatus phosphovorus and their application for rapid host detection. Lett Appl Microbiol. 42(3):259-64. Wilen BM, Onuki M, Hermansson M, Lumley D, Mino T. (2006) Influence of flocculation and settling properties of activated sludge in relation to secondary settler performance. Water Sci Technol. 54(1):147-55. Shoji T, Nittami T, Onuki M, Satoh H, Mino T. (2006) Microbial community of biological phosphorus removal process fed with municipal wastewater under different electron acceptor conditions. Water Sci Technol. 54(1):81-9. Chua AS, Onuki M, Satoh H, Mino T. (2006) Examining substrate uptake patterns of Rhodocyclus-related PAO in full-scale EBPR plants by using the MAR-FISH technique. Water Sci Technol. 54(1):63-70. 道中敦子、小貫元治、佐藤弘泰、味埜俊(2006) クローニング法による実下水処理場活性汚泥に存在するポリヒドロキシアルカン酸合成遺伝子(phaC)の解析. 環境工学研究論文集. 43, 135-142. 押木守、小貫元治、佐藤弘泰、味埜俊(2006) 活性汚泥による酢酸摂取へのPHA蓄積細菌の寄与. 環境工学研究論文集. 43, 195-204. T.（2005）In situ identification and characterization of the microbial community structure of full-scale enhanced biological phosphorous removal plants in Japan. Water Res. 39, 2901-2914. Seviour, R., Onuki, M. anc Mino, T. (2003) The Microbiology of Biological Phosphorus Removal in Activated Sludge Systems. FEMS Microbiol. Rev., 27(99-127). Onuki, M., Satoh, H and Mino, T. (2002) Analysis of microbial community that performs enhanced biological phosphorus removal in activated sludge fed with acetate. Wat. Sci. Tech., 46(1-2), 145-153. Schuler, A. J., Onuki, M., Satoh, H. and Mino T. (2002) Density Separation and Molecular Methods to Characterize Enhanced Biological Phosphorus Removal System Populations. Wat. Sci. Tech., 46(1-2), 195-198. Mino, T., Satoh, H., Onuki, M., Akiyama, T., Nomura, T. and Matsuo, T. (2001) Strategic approach for characterization of bacterial community in enhanced biological phosphate removal (EBPR) process. In. Advances in Water and Wastewater Treatment Technology -- Molecular technology, nutrient removal, sludge reduction, and environmental health. T. Matsuo, K. Hanaki, S. Takizawa and H. Satoh (ed.) , Elsevier Science, Netherlands.Pp..21-29. You, S. -J., Liu, W. -T., Onuki, M., Mino, T., Satoh, H., Matsuo, T. and Ouyang, C. -F. (2001) Identification of predominant microbial populations in a non-phosphate removal anaerobic aerobic bioreactor fed with fermented products. In. Advances in Water and Wastewater Treatment Technology -- Molecular technology, nutrient removal, sludge reduction, and environmental health. T. Matsuo, K. Hanaki, S. Takizawa and H. Satoh (ed.) , Elsevier Science, Netherlands. Pp.207-215. Onuki, M., Satoh, H., Mino, T. and Matsuo, T. (2000). Application of molecular methods to microbial community analysis of activated sludge. Wat. Sci. Tech., 42(3), 17-22. 小貫元治、佐藤弘泰、味埜俊 (2000). PCR-DGGE法による嫌気好気汚泥の微生物群集解析. 環境工学研究論文集, 37, 9-16. Onuki, M., Mino, T. (2010) Key concepts for sustainability education. In. Sustainability Science Volume 1. Takeuchi, K.(ed. ), United Nations University Press, Tokyo, forthcoming. 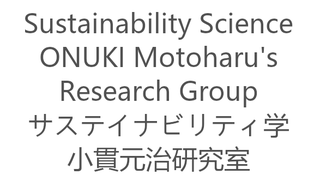 Onuki, M., Mino, T. (2010) Transition of the concept of sustainability science. In. Sustainability Science Volume 1. Takeuchi, K.(ed. ), United Nations University Press, Tokyo, forthcoming. H. Satoh (ed.) , Elsevier Science, Netherlands.Pp..21-29. Xu, Q. Yarime M., Onuki M. "Innovation System on Membrane Bioreactor (MBR) for Wastewater Treatment in China," Annual Meeting 2010 of the Society for Social Studies of Science (4S), University of Tokyo, Komaba Campus, Tokyo, Japan, August 25-28 (2010). ○大辻永, 関友作, 郡司晴元, 伊藤哲司, 中川光弘, 三村信男, ○小貫元治, 味埜俊 (2008) 大学院におけるサステイナビリティ学教育の意義と展開～サステイナビリティ学連携研究機構（IR3S）におけるサステイナビリティ学教育プログラムを例に～日本高等教育学会第11回大会（東北大学）pp18-19. Oshiki, M., Onuki, M., Satoh, H., Mino, T. (2007) Microbial Composition of PHA (polyhydroxyalkanoate)-Accumulating Organisms in Activated Sludge and Its Distribution in Eight Full-Scale Wastewater Treatment Plants. In: Abstracts of 23rd Annual Convention of the Japanese Society of Microbial Ecology and International Symposium on Microbial Ecology, Asia 2007. P72. (Matsuyama, Japan, Sep.15-18, 2007). Fukushima, T., Onuki, M., Satoh, H., Mino, T. (2006) Development of Quantitative PCR Method for The Quantification ff Candidatus ‘Accumulibacter Phosphatis’ in Activated Sludge. In: Proceedings of 11th International Symposium on Microbial Ecology (ISME-11), pp262, August 20-25, Vienna, Austria. Oshiki, M., Onuki, M., Satoh, H., Mino, T. (2006) Microbial Community Structure of Polyhydroxyalkanoates(PHA)-Accumulating Microorganisms in Activated Sludge by Buoyant Density Separation and Denaturing Gradient Gel Electrophoresis(DGGE) Analysis. In: Proceedings of 11th International Symposium on Microbial Ecology (ISME-11), pp307, August 20-25, Vienna, Austria. Otawa, K., Onuki, M., Satoh, H., Mino, T. (2006) QUANTIFICATION OF PHAGE DNA OF ACTIVATED SLUDGE WITH THE PICOGREEN FLUORESCENT DYE. In: Proceedings of 11th International Symposium on Microbial Ecology (ISME-11), pp222, August 20-25, Vienna, Austria. 佐藤弘泰、小貫元治、味埜 俊(2005) 実験室規模嫌気好気活性汚泥プロセスにおけるリン除去失敗事例の解析. 第８回日本水環境学会シンポジウム講演集, P45, 2005/9/12-13,大津市. Chua, ASM., Onuki, M., Satoh, H. and Mino, T. (2005). Examining substrate uptake patterns of Rhodocyclus-related PAO in full-scale EBPR plants by using MAR-FISH technique. 4th IWA Activated Sludge Population Dynamics Spcecialist Conference (ASPD4). Pp15-22. Shoji, T., Nittami, T., Onuki, M., Satoh, H. and Mino, T. (2005). Microbial community of biological phosphorus removal process fed with municipal wastewater under different electron accepter conditions. 4th IWA Activated Sludge Population Dynamics Spcecialist Conference (ASPD4). Pp31-38. Wilen, BM., Onuki, M., Hermansson, M., Lumley, D. and Mino, T. Influence of flocculation and settling properties of activated sludge in relation to secondary settler performance. (2005). Microbial community of biological phosphorus removal process fed with municipal wastewater under different electron accepter conditions. 4th IWA Activated Sludge Population Dynamics Spcecialist Conference (ASPD4). Pp175-182. 荒生　遵，小貫元治，佐藤弘泰，味埜　俊（2005）活性汚泥を用いた生物分解性プラスチックの生産とその物性. 第39回日本水環境学会年会講演集. P.193. 大江　華，小貫元治，佐藤弘泰，味埜　俊（2005）生物学的リン除去プロセスに出現する主要細菌の探索. 第39回日本水環境学会年会講演集. P.406. 小貫元治, 佐藤弘泰, 味埜俊（2004）生物学的リン除去活性汚泥中の微生物群集とその挙動・機能. 第7回日本水環境学会シンポジウム講演集. P.74. 小貫元治、福島寿和、佐藤弘泰、味埜俊（2002）アミノ酸を主な炭素源として馴養した生物学的リン除去活性汚泥の微生物群集解析. 第36回日本水環境学会年会講演集p495 Onuki, M. (2000). 小貫元治, 佐藤弘泰, 味埜俊, 松尾友矩. (1998). PCR-DGGE法による活性汚泥の微生物群集解析. 第1回日本水環境学会シンポジウム講演集. 211-212. 小貫元治, 佐藤弘泰, 味埜俊, 松尾友矩. (1997). 遺伝子プローブを用いた活性汚泥中の微生物相の解析. 土木学会第52回年次学術講演会講演集, 542-543.